Dioramas and Clever Things: Happy 93rd Birthday Hank Williams Sr. Happy 93rd Birthday Hank Williams Sr.
Hank Williams died when he was just 30 years old. He would have been 93 today. Instead of posting his bio, which you can read on on-line, I've posted below some passages from Bob Dylan's 2004 Chronicles, Volume I. This is from the 2004 book written by Bob Dylan, Bob Dylan, Chronicles, Volume I. It’s from the first part of the book where Dylan discusses his influences. 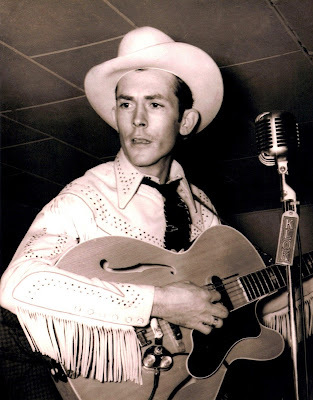 “The first Time I heard Hank he was singing on the Grand Ole Opry, a Saturday night radio show broadcast out of Nashville. Roy Acuff, who MC’d the program was referred to by the announcer as “The King of Country Music.” Someone would always be introduced as “the next governor of Tennessee” and the show advertised dog food and sold plans for old-age pensions. Hank sang “Move It On Over”, a song about living in the doghouse and it struck me really funny. He also sang spirituals like “When God Comes and Gathers His Jewels” and “Are you Walking and a-Talking for the Lord”. 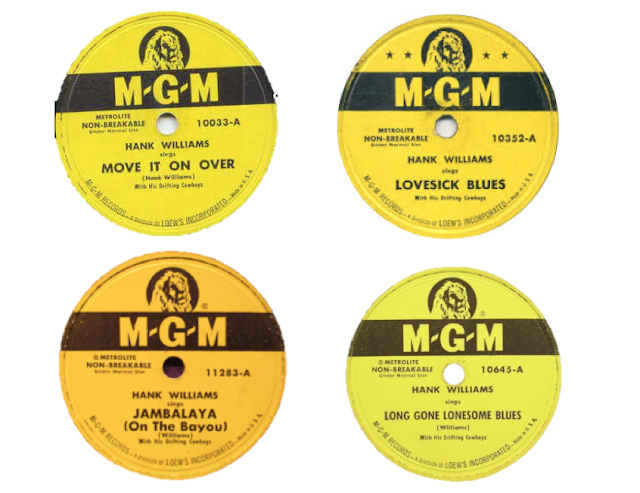 The sound of his voice went through me like an electric rod and I managed to get a hold of a few of his 78s – “Baby We’re Really In Love” and “Honky Tonkin’” and “Lost Highway “ – and I played them endlessly. They called him a “hillbilly singer,” but I didn’t know what that was. Homer and Jethro were more like what I thought a hillbilly was. Hank was no burr head. There was nothing clownish about him. Even at a young age, I identified fully with him. I didn’t have to experience anything that Hank did to know what he was singing about. I’d never seen a robin weep, but could imagine it and it made me sad. When he sand ‘the news is out all over town”, I knew what news that was, even though I didn’t know. The first chance I got, I was going to go to the dance and wear out my shoes too. I’d learn later that Hank had died in the backseat of a car on New Year’s Day, kept my fingers crossed, hoped it wasn’t true. But it was true. It was like a great tree had fallen. Hearing about Hank’s death caught me squarely on the shoulder. The silence of outer space never seemed so loud. Intuitively I knew, though, that his voice would never drop out of sight or fade away – a voice like a beautiful horn. Much later, I’d discover that Hank had been in tremendous pain all of his life, suffered from severe spinal problems – that the pain must have been torturous. In light of that, its all the more astonishing to hear his records. It’s almost like he defied the laws of gravity. The Luke the Drifter record, I just about wore out. That’s the one where he sings and recites parables, like the Beatitudes. I could listen to the Luke the Drifter record all day and drift away myself, become totally convinced in the goodness of man. When I hear Hank sing, all movement ceases. The slightest whisper seems sacrilege.